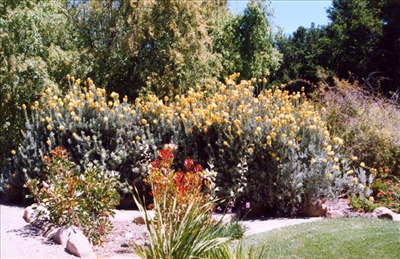 Large ornamental shrub 8-12'x8-12', with sulphur yellow pincushion flowers and grey foliage. Excellent shrub for well-drained soils. Flowers best in open sunny position. Beautiful garden speciman for large gardens. Good long stemmed cut flower and container plant for several years..